In the summer after 17-year-old Trayvon Martin was shot to death by a neighborhood watch volunteer in Florida, Noah McQueen, 16, sat in a juvenile detention center in Cheltenham, Maryland, and wrote down a list of goals: Get on the school newspaper team. Get on the football team. Graduate. Live long enough to graduate. Black, fatherless, silently fearing the next fork in his life, McQueen lived just 22 miles from a man who had shared many of those traits when he was 16, but now was in a position to change the calculus for tens of thousands of boys like McQueen. Stung by Martin’s death, President Barack Obama, who observed, “If I had a son, he’d look like Trayvon,” began to plan a multipronged public-private initiative called My Brother’s Keeper to help young men of color reach their potential through mentoring and educational programs. Two years after it formally launched in 2014, My Brother’s Keeper hopes to pair another 250,000 sixth- and ninth-graders with mentors over the next two years, adding to the roughly 30,000 already working together. Obama, an original mentor, and McQueen, one of the teens he counseled, will gather in Greensboro, North Carolina, on Tuesday to talk about the program as part of The Undefeated’s A Conversation with The President: Sports, Race and Achievement, to be broadcast at 10 p.m. on ESPN and the ESPN app. 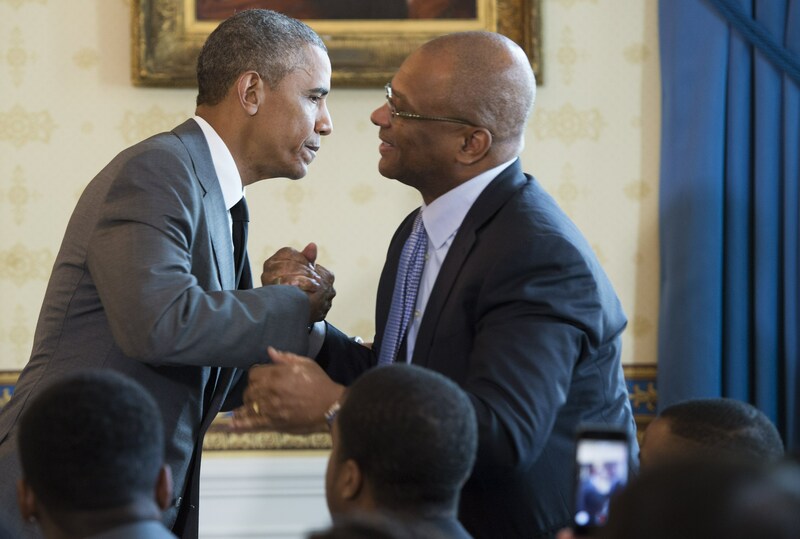 President Barack Obama embraces Broderick Johnson, Cabinet secretary and chair of My Brother’s Keeper, during the White House Mentorship and Leadership graduation ceremony in the Blue Room of the White House in Washington, D.C., on June 15, 2015. The program is also one of the first genuine hints as to how Obama will spend at least some of his postpresidency. McQueen, who estimated he has now seen the president on six occasions and had several hours of one-on-one conversations with him, has turned his life around. After being sentenced to home detention four years ago, McQueen is now a 20-year-old sophomore sociology major at Morehouse College. Like most college kids, he said he’s exhausted from studying for midterms last week. He muses wistfully about that last goal he wrote down in 2012, why his own mortality should be an open question, rather than a societal right for every black teenager in America. My Brother’s Keeper is the first national cradle-to-career program of its kind, ambitiously using mentoring as just one important cog in a young man’s development. For Obama, the need for My Brother’s Keeper represented an acknowledgement of how much more healing the nation needed, how the hope-and-opportunity gap for young men of color, particularly African-Americans, had not closed but in fact had widened. To ensure its existence beyond his administration, My Brother’s Keeper Alliance, a nonpartisan nonprofit independent of the White House, was established in May 2015. The president spoke at the launch in the Bronx, making it clear it would be his and the first lady’s personal priority beyond January 2017. The Alliance is focused on economic opportunity at the moment. For instance, it hosted a career fair in Oakland, California, in July. Thirty-one companies conducted 600 interviews, offering 325 applicants jobs on the spot. Blair Taylor, the CEO for My Brother’s Keeper Alliance, said the numbers hardly did the event justice. Older white business leaders and young job candidates of color shared tears while sitting across from each other in some instances, he said. 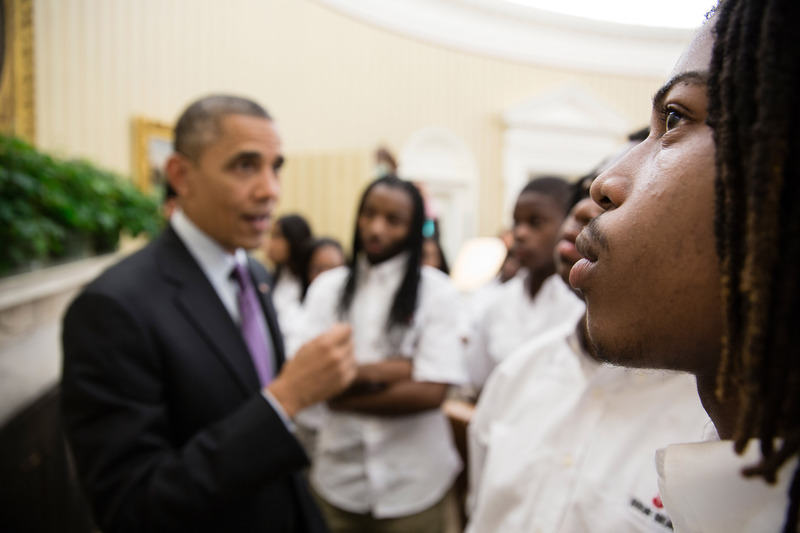 Students from William R. Harper High School in Chicago listen as President Barack Obama talks with them about the Emancipation Proclamation hanging in the Oval Office on June 5, 2013. Altruism as a motivation is taking a backseat to business strategy. “The demand side is now saying, ‘Wait, we need that guy,’ ” Taylor said. The NBA and its players and retired players’ associations were among the first corporate partners. They recently exceeded a target of attracting 25,000 mentors to the program – a five-year goal that was accomplished in less than 30 months. Nearly 250 communities in all 50 states, 19 Tribal Nations, Washington, D.C., and Puerto Rico have accepted the president’s My Brother’s Keeper Community Challenge, dedicating resources toward giving young men of color more opportunity. They include cities such as Chicago, Milwaukee, Baltimore, and Compton, California, with some of the highest rates of violent crime in the country. Launched a few months ahead of an angry summer in Ferguson, Missouri, and repeated images of black men, many unarmed, shot to death by white law enforcement, My Brother’s Keeper got started as America’s racial cauldron had just begun to boil over again. It is against this backdrop that critics of My Brother’s Keeper, many from black academia, knock the president for not addressing systemic issues of sanctioned racism. And yet no president has gone to these lengths to be a hands-on role model and mentor. He has sat with youths in the White House, in Chicago and in Camden, New Jersey. Often his message is one of self-help and the imperative to overcome one’s circumstances — whatever they are and however they were created. It is a criticism Obama has heard before, including when he called out absent black fathers during a Father’s Day campaign speech at a black church in Chicago, and when he gave a graduation speech at Morehouse in which he emphasized personal responsibility. To date, his critics have not moved him. “I am a black man who grew up without a father and I know the cost that I paid for that. And I also know that I have the capacity to break that cycle, and as a consequence, I think my daughters are better off,” he said once during an appearance at Georgetown University. And officials at My Brother’s Keeper say the criticism is also misplaced and they’re working on systemic issues. For instance, Bloomberg, a program partner, is providing implicit bias training to employees in roughly a dozen cities. The Department of Justice, in collaboration with My Brother’s Keeper, has launched an initiative on building community trust and justice. And MBK has also been responsible for enlisting many public schools in rethinking their disciplinary measures, including the elimination of suspensions. Johnson remembered the president calling him soon after Martin’s death. For many of the young people taking part in the forum and Q&A with Obama Tuesday night, this likely marks the final time they will interact with him as president. 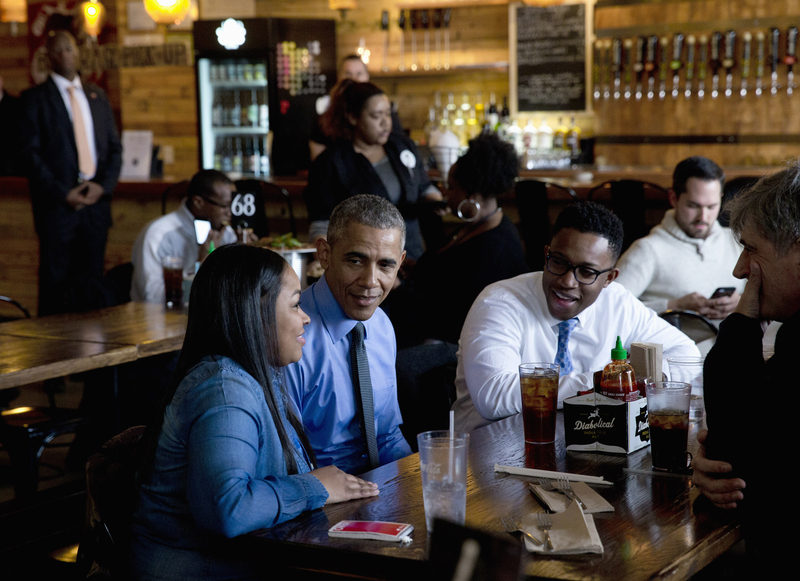 President Barack Obama has lunch at the Jolly Pumpkin Brewery in Detroit on Jan. 20 with (from left) Teana Dowdell, autoworker at the General Motors Detroit-Hamtramck Assembly; Tolulope Sonuyi, an emergency medicine physician engaged with Detroit youths through violence prevention and intervention programs, part of Detroit’s efforts around the My Brothers Keeper initiative; and Tom Kartsotis, founder of Shinola. Coupled with fights, suspensions and suspected gang involvement, his GPA during his freshman and sophomore years was 0.1. Still, a high school teacher believed in his ability to change. “[The teacher] would say, ‘You are going to be great one day, Noah.’ I thought this dude was tripping to the utmost,” he said. The day he left the juvenile detention facility, he went straight to the high school football field, still wearing his detention ankle bracelet. After much coaxing and raising his GPA to a required-to-play 2.0, he eventually made the team as a fullback and linebacker. He became an editor on his school newspaper. By the end of high school, he had raised his GPA to 3.72 and actually started the inaugural mentor program at nearby Barack Obama Elementary School. Just in the past year he’s spoken at the White House and shared the Democratic National Convention stage on the same night as Hillary Clinton. It’s still surreal to him. They would talk, not just about school but about basketball stars LeBron James and Steph Curry. About growing up without a father, how you don’t realize the anger coming out sideways sometimes. Johnson and Michael Smith, the director of My Brother’s Keeper at the White House and a special assistant to the president, speak often with McQueen and pass along messages when Obama cannot. “He goes through the same things we all went through in college,” Johnson said. “Noah has a profound sense of social justice and giving back. We’ve seen that already. But we’ve had to remind Noah, your first responsibility is to get the grades. And to do well in school. We know you’ll be a leader, but how are your grades? How’s your dorm situation? How are your roommates? How hard are you studying? There are perks, of course, to finding out about another D.C.
During their second meeting with the president, someone began talking up their game. Obama signaled to an aide and suddenly the My Brother’s Keeper mentees were being schooled. Senior writer Michael A. Fletcher contributed to this report.